Our days are about ‘the global issue’, about ‘climate change’. All temporary human conflicts dwarf in comparison to the disasters we are about to bring upon ourselves and all generations to come. We are about to lose a paradise, because of our greed and folly, our short-term thinking and ignorance, we are creating a ‘paradise-lost’, forever. We may look at human life as a murderous deal or as a great spiritual opportunity, whatever it is, we all agree on the beauty of Nature (without us). Life is a miracle, that is its entrenching beauty, we can’t get enough of it although or because we don’t understand it and we live most of the time as if we will never cease to exist, but we haven’t got a clue. To what extent we actually bother about the future of mankind is hard to say. At least we have no qualms about using all the natural resources within our grasp. We use the rarest materials and turn them into waste, we are prepared to risk immeasurable ecological disasters to squeeze the last drops of oil from the earth’s crust; our time will be loathed and cursed by future humankind, because we have wasted resources we did not even know the real value of. Platinum in exhaust pipes, tungsten in batteries, all resources gone in the foreseeable future and no way to stop it. This whole (economical) attitude of short term goals and reckless exploitation brings us the waste and pollution that will eventually suffocate us probably, as the oxygen production falters when the green lungs of the earth will turn into brown slime and the end of higher life must be nearing. To what extent the global pollution is the major agent of the present climate change is under debate, which does not mean that it would not be a factor, it means there may be other natural factors that have an influence. For me it is a glimmer of hope that the present climate change may be exacerbated by accidental natural causes like planet alignments that cause gravitational friction within the liquid bodies of planets (tectonics, volcanism) and even the sun itself. I need this hope because otherwise I do not see how long-term effects of destruction can be avoided, since the point of no return may well have been reached already in that case. Although we jolly well knew that there had been changes in climate most notably ‘remembered’ as ‘Ice Ages’, in our everyday life’s experience the climate was quite stable although the weather was a bit unpredictable in the short term but as it was, not much climate change was going on, it seemed and it was no issue. This is remarkable because the Little Ice Age, a recent 500 year long cold spell in Europe lasted well into the 19th century (1850) and was known to geo-scientists and (art-) historians. Things are changing now, we are aware of the climate, but not yet of its status embedded in the solar system, it seems to me. Although there is still a strong and very powerful contingent of climate change-deniers under scientists, politicians and business professionals, the wider public and media get more and more concerned especially so when indeed now extreme circumstances are occurring in many different places and being highlighted by the media. (Even the English now get seriously wet feet). During my research concerning the recent Little Ice Age, I came across this graph where a similar glaciation and high wind circulation occurred during a period in the Neolithic. What especially intrigued me were the relative abrupt start and finish, this abruptness was accentuated by great temperature differences, from low to high in a short while, say, less than 50 years and at the end of ‘the age’ a similar sudden change again. 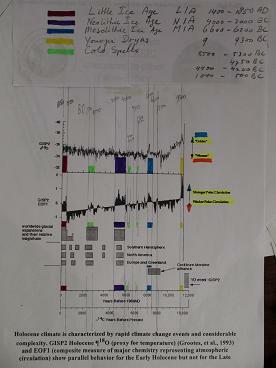 I am still hoping against hope that part of the climate change has to do with an incident of geometrical (gravitational) friction in the solar system orbits which would cause a heating of the Earth core which would result in an imperceptible rise in (infra-red) radiation through the crust, resulting in a warming of the atmosphere. Especially recent alignments of the planets may have caused stress to the Earth’s inner core (unexpected Mt. St Helens), because, if a major alignment can trigger as much as a 2% rise in the global high-tides (eclipse), than -given that all is vibration- this gravitational friction will have affected the tides of the molten core of the planet as well and may have produced an excess in heat generation from the normal. I think it is important to view big issues over long periods of time in their proper perspective, we cannot deal with climate change properly when we have a rigid, short term view on the climate. There is no such thing as ‘a stable climate’, we very well know that, but what the leading causes for the big changes that occur are, we do not know at all, although now some strong indications are present. I believe though that the general climate changes so far are expressions not of the activity of the Sun but of the frictions in the solar system’s gravity and inertial fields. Scientists still refuse to understand the one-ness of the totally integrated system. The so-called Bary-center of the solar system is its real centre of gravity, but this centre moves in and out of the body of the Sun, or maybe better to say: the Sun wobbles around this centre in a perpetual stress, sometimes more, sometimes less. This measure of stress is depending on the planets and especially on Jupiter with its dominating mass of which the orbit coincides with the Sun spots every 11- something years. So this is my theory of hope, that the sudden warming of the atmosphere is partly due to temporary stress in the solar system’s inertial deep-field. [It should be noted here that Jupiter is only 1/1000 the mass of the Sun, revolves in an orbit far, far away, but is still capable of causing sunspots that would cause changes on the Earth in the shape of ‘cold spells’, which we have named ‘Ice ages’. Jupiters influence is so great probably because it rotates so fast, as does Saturn btw, which spin much have extra leverage in the equilibrium of the Sun that is very dependent on Jupiter’s orbital rotation, like the stability of the Earth depends on the orbit of the moon. Although the stabilizing forces are enormous, they cannot be measured, only calculated. To understand the building activities of Stone Age Atlantic European people we do well to place them against a background of climate change and to learn from them to look to the future and future generations and to build communal refuges also in times when there is no immediate need for them. The megalithic chamber is seen as initially a communal refuge place, or bad weather hide-out (fishermen), later evolving into a multipurpose space (cosmological) where very seldom burials took place; this is the cornerstone of my theory. Burial in a megalithic chamber has as little to do with its original function as burial in a church has with the function of the church. Besides that it is maintained here that the bones of people in the chambers are usually of those who died there and did not survive the cold spell. It is a totally different perspective from the archaeological paradigm of a Neolithic death-cult and it is probably with its wealth of better arguments closer to the truth. For what I gathered (over the years by now) I’ve become convinced that it were the harsh conditions along the Atlantic littoral, from Portugal to Sweden, that made people decide to build huge refuge places insulated by massive amounts of stone, the origination of the megalithic chamber, the shelter of rock over-ground, like a cave in the rock under-ground. With their sometimes long entrance tunnels they resemble animal dens and with their corbelled domes they resemble igloos. There is at present no archaeologist who agrees with me, but that is mainly because it would be too embarrassing to have to admit a totally wrong interpretation on their behalf of these chambers as iconic buildings of the New Stone Age; archaeologists have never questioned the megalithic chambers had a primarily funeral function, whereas that ‘use’ was in fact an outflow of the tragic circumstances that would develop when people could not survive a cold spell one winter and died collectively in a chamber. It could very well also have been custom to leave the dead where they were when their remains were found by others during a next forced use of the chamber, this could be a generation later and no relatives at all. The treatment of bones in chambers is very diverse, from ordered to absolutely chaotic, seldom interred. Like in the Mesolithic people were probably used to keeping bones of the dead near them in their dwelling places or even take the dead into the house, as is still done in Guadeloupe today (for instance), and also very evidently happened at Skarabrae in Orkney at the time, where two graves were found under house-walls. Death and burial was probably much more a domestic issue than is suggested by the ‘cult of the dead’-paradigm that holds sway over archaeology today. though, is known to stray into the North Sea today and is remarkable for its tropical colours, so a precious and easy catch! This means its (rare) occurrence on the Orkney record is no argument at all for, overall, warmer weather. The graph also shows that the climate is a changeable phenomenon and that the idea of a stable climate is a fiction, but this does not mean that human action has no influence for good or for bad. The point is we have to learn to live with sudden climate change as a real possibility. (One thing I’ve learned from my study of the megalithic stone age is that going underground is a perfect option). 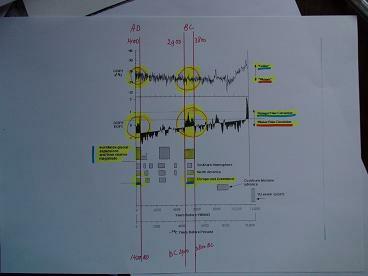 The graphs show that both starts of the recent Little Ice Age and of the Neolithic Ice Age were preceded by a sudden rise in temperature and then an extreme fall in a very short term. Around 2900 BC the weather was already above average again, which in fact meant the end of the use of the chambers as refuges and also the end of the megalithic Funnelbeaker culture in northern continental Europe, which may be causally connected. This would not have been different for Orkney of course, close as it is to the Scottish coast ( some 20 Miles away in the south), but the Highlands had woods and sheltered valleys, whereas Orkney had only pioneer tree vegetation; by 3000 BC though, the end of the Neolithic Ice Age, Orkney had only some scrub left, all birch, hazel and willow that had dominated the landscape of the southern isles, before the high winds came, had gone, used for housing and for fuel, most probably, or just perished in the salt winds, as still today hardly any trees grow in Orkney because of the high winds. Thus, Orkney was certainly no paradise for a substantial period in the Neolithic, although it probably would have been warmer than Scottish northern Caithness where some similar chambers were built. This severe climatic period brought about the challenge to improve living conditions to survive, which paid off in numerous innovations. The Neolithic Ice Age would have caused the widespread building of survival chambers where the coastal peoples of Europe could weather the gales from the Atlantic and North Sea when these ravaged their homes and the conditions became life-threatening especially for children, the elderly and pregnant women. The average age was thirty; by that time the ratio of men to women was 3:1, at the age of twenty, it was already 2:1. The survival of the population may have been at stake for considerable periods, the demographic situation was alarming. It is these demographic and climatic conditions that initiated the communal effort to building the sometimes huge chambers, not some kind of, by archaeologists invented, all pervading ‘cult of the dead’. The chambers were a symbol of survival, of intense communal experience, also of loss, and of growing reverence for the ancestry who built them, and sometimes perished in them, they revered the chambers the older they got. Imbued with the auspicious spirit of the ancestry some people brought bones of their dead, which they may usually have kept at home, to the chambers. It was very rare for a person to be interred in the floor of the chamber, may be even done ‘clandestinely’, but the chambers were in no way built for that purpose; churchyards and churches are the most obvious expression of the wish to be buried near or in an auspicious and ancestral place, where other dead are gathered and may have perished, as a preferred gateway to the other world. Maeshowe was probably not primarily built as a place of communal shelter and storage of food as earlier chambers, although it kept the possibility of serving as such, no, Maeshowe was built for scientific, clinical and healing purposes and for the storage and eternalizing of knowledge. Maeshowe may have been earlier than or contemporary with the Egyptian pyramids, it is a conceptual blueprint in terms of embodying the state of the cosmological/scientific knowledge of a culture of its day, solidified in stone, to be preserved for posterity. Most curious of all is that its mathematics and dimensions show striking similarities with Giza in Egypt. A full blown enigma. This website is a continuing assemblage of evidence and arguments for the view that a sophisticated cosmological and scientific culture developed on the British Isles moving its centre of gravity from the Boyne Valley to the north via the Hebrides to Caithness and Orkney and to the south via Wales to Wessex as the apex of the Atlantic Megalithicum that may have started in southern Portugal, maybe even borrowing building techniques (Tholoi) from northern Africa or the Middle East.